With the world’s largest amount of malnourished children, can India come to grips with its problem? It is normal for motorists at traffic signals in most Indian cities to come across children knocking on their car window panes or tapping two-wheeler riders on their shoulders asking for charity. The point is not whether the motorists oblige the children but the question is: what are the children doing on the streets instead of playing or studying like many others in their age group do? Reflecting this grain of reality are statistics from a well-respected global initiative revealing the larger picture that India accounts for one-third of the world’s children with stunted growth. This, while sobering, does not really surprise given the social inequity that continues to plague the country despite advances on several fronts. For example, the country belongs to the exclusive global nuclear club, and is a favoured destination among nations wanting to send satellites to space using Indian rockets and a world leader in information software technology. In a country like India, with all its modern trappings and a certain sense of pride in its development since independence 70 years ago, it is difficult to reconcile the image of an aspiring superpower with the undeniable reality at the traffic signals. For the privileged motorist at the traffic signal, the presence of children begging for money is a daily normal occurrence, taken for granted and something that has always been part of the landscape. But the reality is grim. According to the Indian National Human Rights Commission, some 300,000 children are forced to beg across the country. The 2018 Global Nutrition Report released earlier this week therefore serves to show Indians, especially those with a self-inflated perception of the country’s economic development and social modernity, a reality that no government has been able to address effectively so far. According to the report, the findings of which were released on November 29, some 46.6 million Indian children suffer from stunted growth. And the reason for this is mainly due to malnutrition. The scale of the problem dwarfs the nearest competitor which is Nigeria currently with 13.9 million children with stunted growth, a distant second. India has notched up another “achievement” too – it has the highest number of ‘wasted’, or emaciated, children in the world at 25.5 million. The report says that the children suffering from malnutrition and consequently suffering from stunted growth and wasting are spread across the country in varying numbers and both in urban and rural areas. Not surprisingly, more of the affected children are found in rural areas. At the time of independence in 1947 India, under British rule, was wracked by extensive inequality in society, extending into economics and politics. Society was highly feudal with a social hierarchy marked by caste divisions and discrimination on a massive scale. Economic power was concentrated in the hands of the land-owning class in what then was a largely rural-dominated India. And, political power which flowed from social and economic privileges was concentrated in the hands of the elite. Successive governments in independent India were wary of embarking on making fundamental changes though there was enough populist rhetoric on the issue. Some socialist tinkering was attempted in the form of limited land reforms and state control of key sectors of the economy like infrastructure, agriculture, defence and communications. This had a cosmetic effect, if at all. Economists described the character of development as the “trickle-down” effect, that is, development emanating from the cities and among the privileged would somehow trickle down to the underprivileged in urban and rural areas. The trickle, has over the years, remained a trickle and large sections of the population are still awaiting their turn. There has never been an attempt to convert this figurative trickle into a flood. While there is no doubt that India has progressed somewhat in the last seven decades as an independent nation, the latest global report on nutrition is an indicator that the country has largely failed to address the basics. What makes the situation tricky is that uneven development in various directions has given the opportunity for the government, the elite and the privileged among the middle class to claim that India is fast heading towards the status of a developed country, if not a superpower. And this is backed by selectively trumpeting those areas where progress is perceptible as in satellite technology, nuclear power, information technology and crop cultivation, among a few others. On the specific issue of nutrition, which is directly linked to accessing food, schemes to benefit the underprivileged have largely remained on paper. The public distribution of schemes (PDS), one of the ways by which food at a low cost was intended to reach the poor, has never been strictly implemented in most parts of the country. The loopholes in the system mean that the food – grains and other basic commodities – end up never reaching the marginalised. Instead, the foodgrains are syphoned by vested interests and sold on the black market, among other things. In one recent instance, the chief of the PDS in the southern state of Andhra Pradesh J R Pushpa Raj warned the staff manning the system to desist from indulging in fraud in implementing the system. 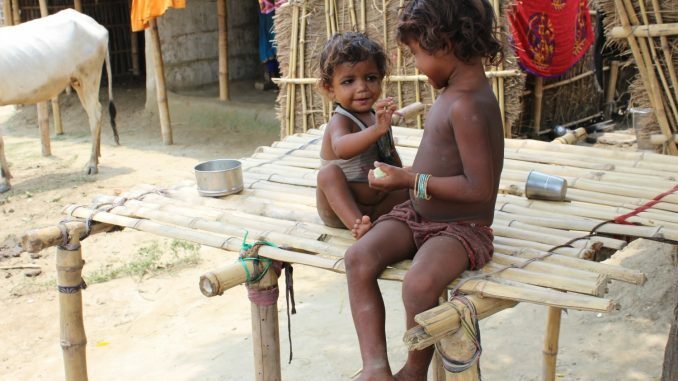 It is in this context that the report on global nutrition that severely indicts Indian failure to address basic issues including the health of children will hopefully bring back attention to areas that otherwise no longer make headlines, or even if they do, transiently. More importantly, the findings should hopefully prick the conscience of lawmakers and the privileged into taking substantial action to correct the injustice.